Birthday Roses Our fresh roses are handpicked from rose farms in Colombia, the best possible source for roses. Send birthday roses to your special person and know they will enjoy longer lasting roses in their home. A birthday rose flower arrangement could be made up of bright colorful flowers, or the recipient's favorite color. 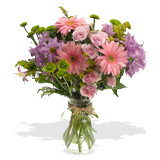 For each month there is a special birthday flower so if you are unsure what arrangement to give, choose one of our marvelous designs with the specific flower for the month.